WC4BP Integration allows to the user manage Woocommerce Payment Methods from BuddyPress including Woocommerce Payment Methods screen and functionalities into the BuddyPress environment through the WC4BP Integration plugin. WC4BP require Woocommerce has installed payment gateways that support the "Add Payment Methods" functionality or "Tokenization". 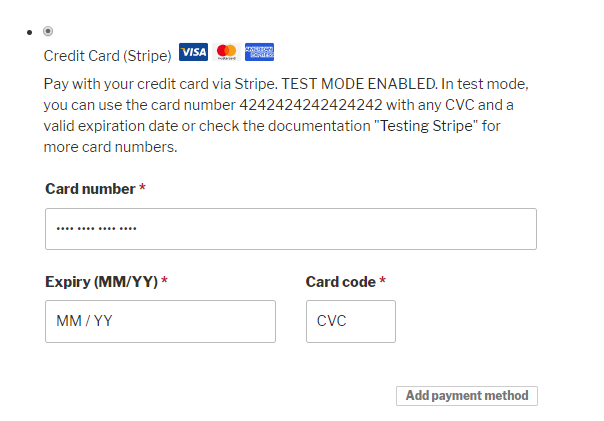 The Woocommerce Stripe Gateway is a good candidate for the user to install and begin to take credit card payments on the store using Stripe. Once the user has installed a payment gateway that supports the "Add Payment Methods" functionality, WC4BP will show the configuration for the Add Payment Method Tab in the WC4BP Settings page. In this page, the user can define if the Payment Methods tab will be displayed in the Front-end. This Tab will allow the user to manage his Woocommerce Payment Methods from BuddyPress. 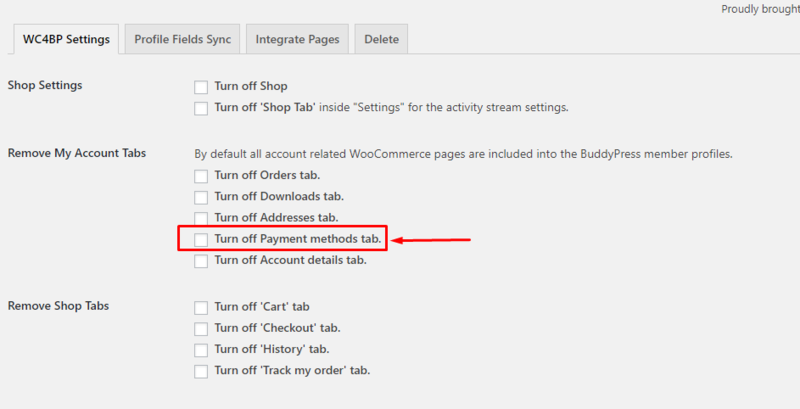 The user can list, delete and add Payment Methods for Woocommerce using the WC4BP plugin. If the user wants to add a new Payment Method such as a new credit card, pressing the "Add payment method" button can achieve that goal. Using this form the user can add his credits cards so the site will store this cards and the user later can use it when shopping in the Woocommerce store. When the user has only one card added and this card is used for automatic subscription payments, the delete option will not be shown. If the user wants to delete this card must add another card or cancel the automatic subscription in which the card was used. If another card is added the delete button will appear and the user can remove the card.